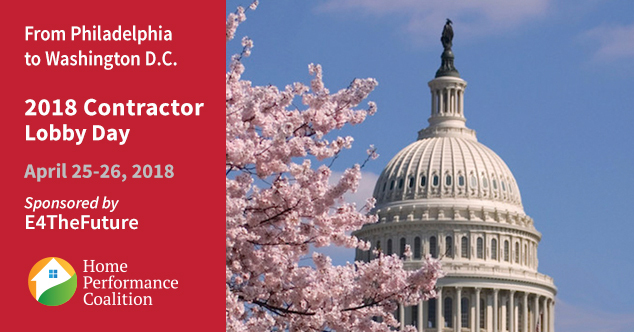 By now you have probably heard – as part of this year’s HPC National Home Performance Conference & Trade Show in Philadelphia, we are hosting a federal lobby day in DC! We will leave the conference a day early, take a bus down to DC, and meet with key lawmakers to share your story and explain why sound energy efficiency policy matters. We already have a few sessions on policy and advocacy training lined up for the conference such as: What Is Lobbying? Getting Engaged & Being Counted, The Future of HEMS: Opportunities & Challenges and Best Practices for State Residential Energy Efficiency Policy. Lobby Day will provide you with the perfect opportunity to put all of that new knowledge to the test. The focus of our meetings with congressional offices will be to advocate for funding of residential energy efficiency programs, tax credits for residential retrofits, and other policies that can help advance the home performance industry. It is so important that lawmakers hear directly from you – the industry backbone and job creators – about why these policies are so vital to the advancement of home performance and the creation of more quality jobs creating quality homes across the country. As you have heard from the news, lawmakers in Washington are challenged to pass legislation and we need to be sure that as the bills pile up, they don’t forget that America’s buildings make up 40% of U.S. energy consumption. It is time to help improve the reliability and resiliency of America’s homes through sound energy policy that includes residential retrofits. But we need YOU and YOUR stories to make that happen! Importantly, this opportunity is included as part of the registration fee for HPC National. E4TheFuture is providing transportation from the conference to D.C., as well as dinner on the bus and all lobby materials. HPC is providing policy experts to lead the meetings on the Hill. All you have to do is register for this conference, book your hotel, warm up your voice and get ready to be heard!